Sparkly Runner: Runner's World Half & Festival Weekend Recap: Part 3 and Giveaway! 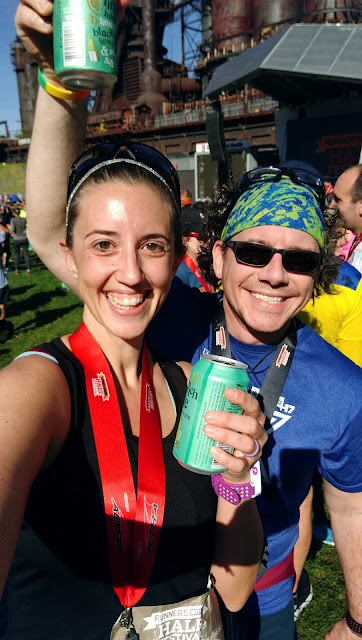 Runner's World Half & Festival Weekend Recap: Part 3 and Giveaway! Last Sunday morning, I woke up early, stiff and sore from running 15+ miles in the two days prior. 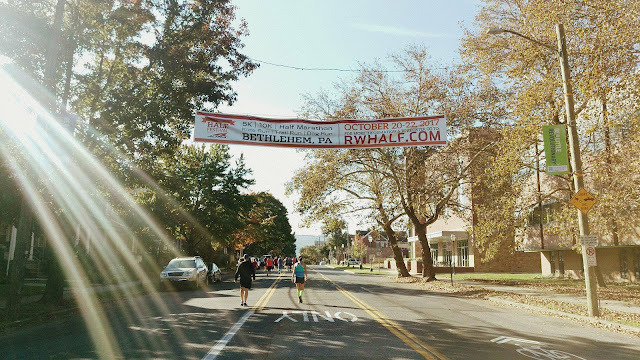 But, I had one more race to complete in the "Grand Slam" at the Runner's World Half & Festival Weekend: the 13.1 mile tour-by-foot of Bethlehem, PA.
As I got ready for the half marathon, I used my Trigger Wheel (from the makers of "The Stick") to roll out some of the tightness in my calves. All the hills in the previous days had caught up to me and I was desperately wishing I'd brought my foam roller with me for the weekend. However, I picked up the Trigger Wheel (as one of the perks of the influencer program) at the expo on Saturday and it helped to ease some of the soreness and muscle pain I had in my calves. 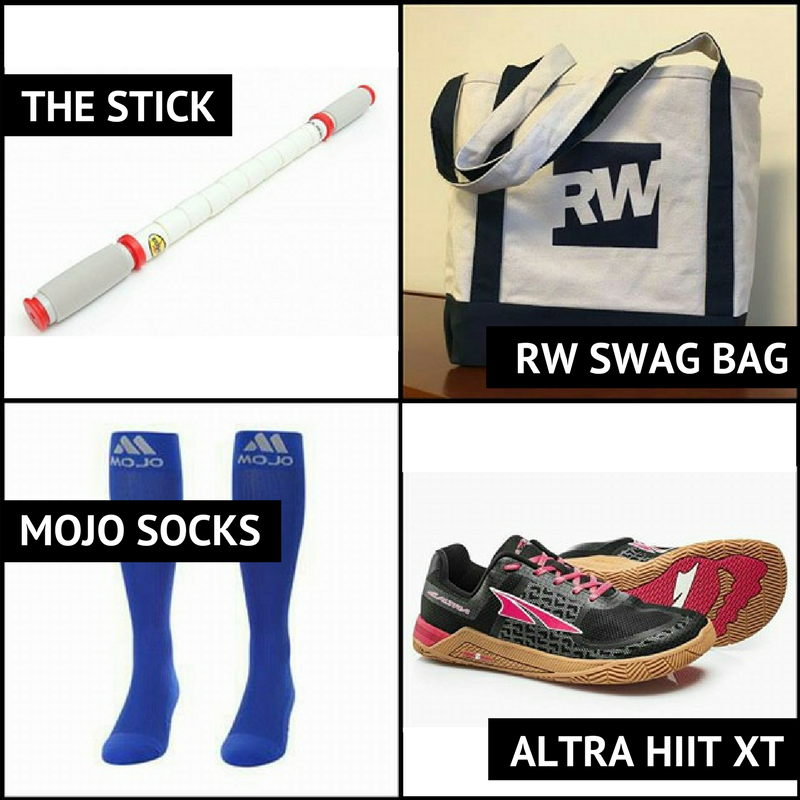 You can read more about how "The Stick" is beneficial to runners here. I got dressed for the marathon, choosing a SparkeSkirt and tank top- the temps were going to be a little chilly in the morning but creeping up near 70 degrees by mid-day. I also chose to wear a brand new pair of compression socks I received from Mojo Socks, also as part of the blogger/influencer program. Now, the rule is "nothing new on race day," but I felt like these socks were going to be super comfortable for the race. Spoiler alert: they were! After Zoe and I got ready and packed our gear bags, we went downstairs to meet our blogger friends for the last morning of this race weekend. We each grabbed some continental breakfast and made our way towards the start line around 7:15- the race start time was 8 am. 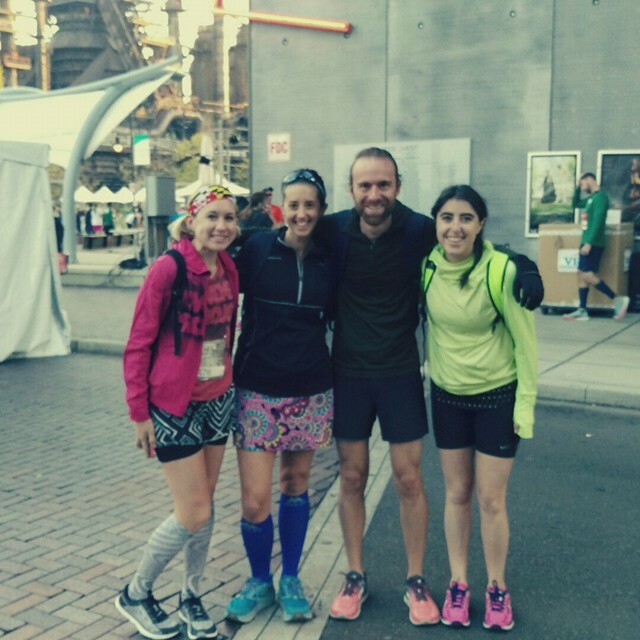 Since we all run at different paces, and weren't sure if we'd see each other after the race, we grabbed a few more pictures, hugged it out, and said our goodbyes. I met up with Matthew and just like the days before, we lined up at the start near the 12:00/mile pace sign. We decided that we'd run this race separately; Matthew runs faster than me and he wanted to see what he could do on this challenging course. He stayed with me as we moved up towards the start, again doing the wave release like we had in the previous races. Right before it was our turn, we said good luck to each other and then Matthew took off ahead of me. 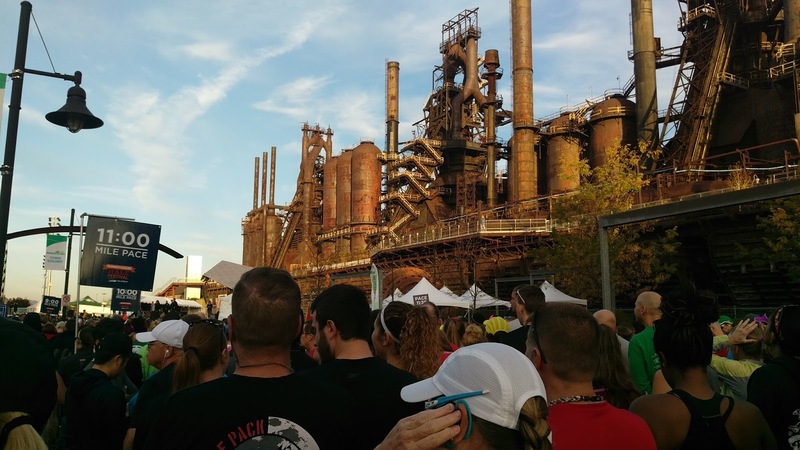 Start lines always have more energy when they're next to Steel Stacks. It's a fact. I had cued up my headphones- like I always do when I run alone- but for some reason I didn't put them on right away. Since this was a new-to-me race, I kinda wanted to experience every bit of the course, the spectators, just the entire atmosphere. I ended up running the entire race without my headphones; a first for me. It was actually super cool and I enjoyed music-free running so much more than I thought I would. The first few miles of this course felt similar to the other races as they followed a similar route. As I was running along, sans music, I saw the 2:45 pace group come up behind me. I decided that I'd try to stay with them as long as possible- knowing how hilly this course would be, I figured that 2:45 would be a good goal for me. 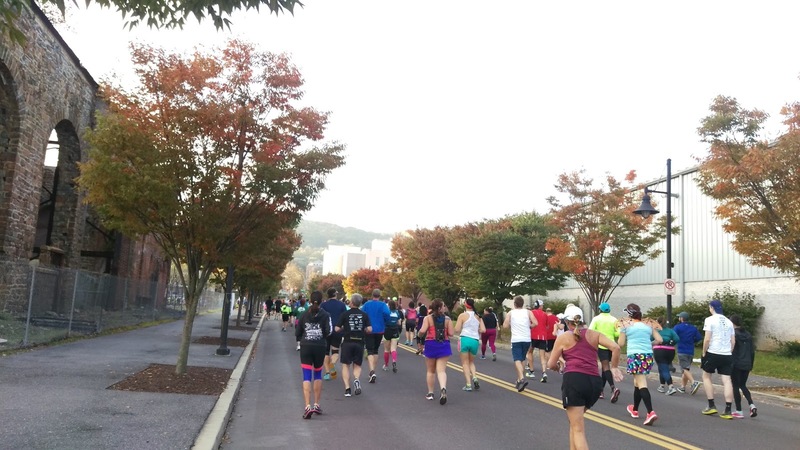 Just after the start- check out those gorgeous fall colors on the trees! Those blurry folks behind me are the 2:45 pace group. This was a really pretty course...even if it was insanely hilly. By about mile 4, I noticed that I was consistently ahead of the pace group and I thought if I pushed it, I could finish this race under 2:45. So that's what I tried to do... while stopping for beer, high-5's from kids, and petting dogs, obviously. I even got to see Matthew on a little out and back section and took a potty break! So, while I was trying to be consistent and beat 2:45, I still was enjoying myself on the race course and honestly, just soaking it all in. I loved almost every minute of this race. The residents of Bethlehem drinking their coffee and cheering from their front porches were super sweet, the other folks running were encouraging and uplifting, and there were some really incredible cheer stations set up with bands, loud speakers with music, and full-on barbecues/parties. Since much of the race was through residential areas, there were folks camped out on their lawns, watching and cheering us on. It was cool. 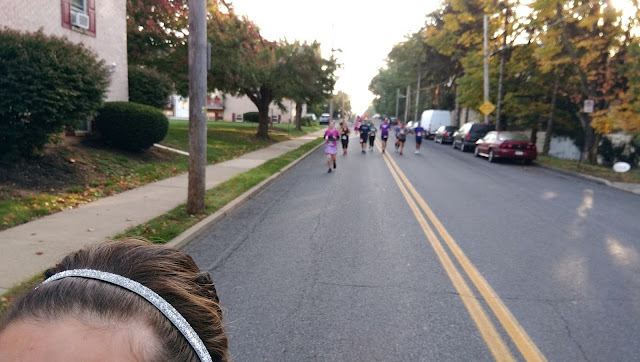 The only part of this race I didn't love was around mile 6- there was an insane hill that went on forever. I mean, right in the middle of the half?! UGH. But, I made the climb and continued on, somehow feeling stronger and stronger as the race went on. It was a beautiful, beautiful day for a race. I finished out the last few miles of the course pretty strong: 12:13/11:22/11:55 splits in the last three miles. I reached my goal of sub-2:45 and finished a course with 547 feet of elevation in 2:41:57. I was pretty damn proud of myself. I've run a lot of races. 24 half marathons, 3 full marathons, and probably close to 100 other smaller distance races. Trust me when I say that this race weekend was one of the best race weekends I've ever been part of. 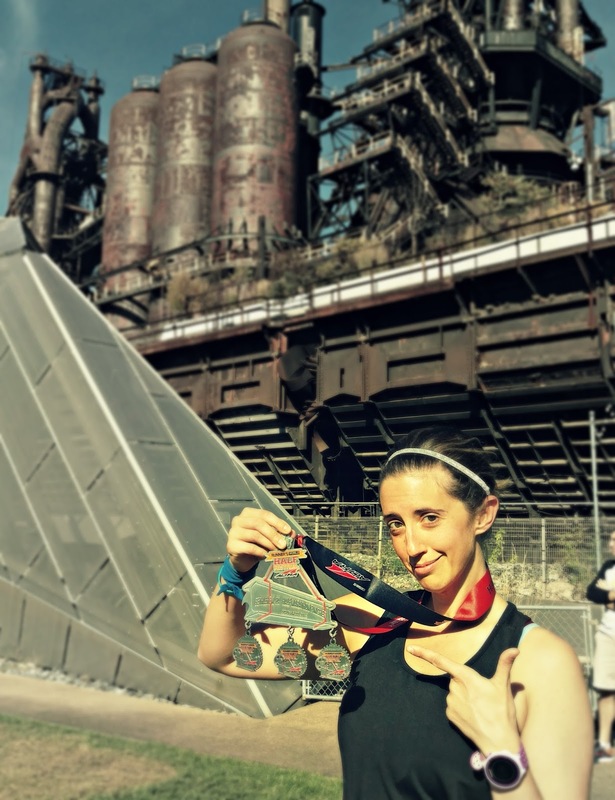 The courses were challenging but beautiful, the start/finish lines were easy and convenient, the expo is full of high-quality vendors, there are ample opportunities to meet and run with Runner's World and Altra staff, and free race photos! And amazing, unique medals. 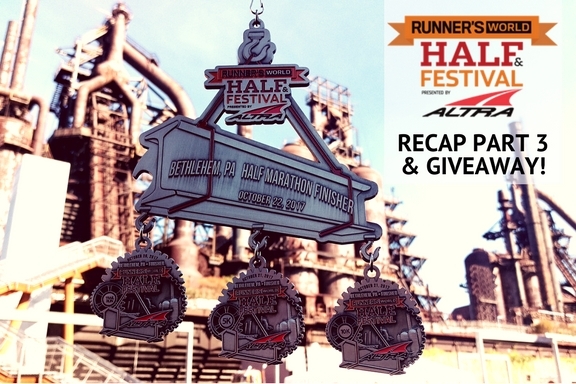 The half marathon medal is not only a bottle opener, but it also had three hooks on it so you could attach the trail, 5k, and 10k medals to it. It is the most unique medal I have ever earned. Will I be back for 2018? Absolutely! Who doesn't love free race photos?! The awesome folks at Runner's World, Altra, Mojo Socks, and The Stick have all generously partnered with me to bring you one heck of a giveaway! How cool is that?! To enter, fill out the rafflecopter below. A winner will be chosen at random next Friday- you can tweet once a day to increase your chances of winning! Good luck! I owe a HUGE thank you to Runner's World and Altra for the invitation to be part of the blogger/influencer program. Yes, being part of exclusive meet-and-greets and getting free stuff is always cool, but the best part of this weekend was all the people I got to meet and get to know. 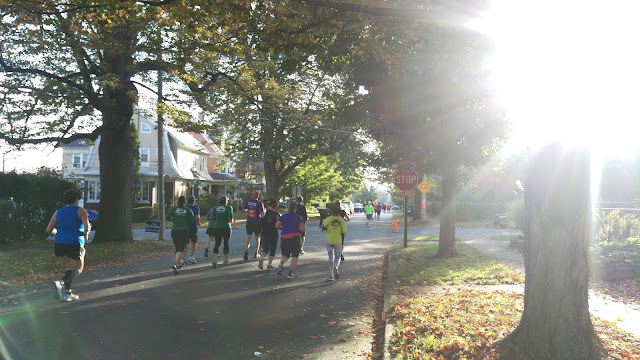 My running family grew larger last weekend and I can't wait to see my new friends out on the road again someday. Thanks, Runner's World, Altra, and Lauren (RW staff who put the whole blogger/influencer program together), for making this an unforgettable weekend full of beautiful memories! The RW Half weekend is one of my favs too!!!! The free race photos are awesome, I wish more races did that! Right?! It just makes sense! Loved following your journey in real time via instagram. It does sound like a great race weekend! Kudos on finishing the grand slam. That's quite a feat... free race photos, love races that do that... my first and second HM did that and I am spoilt now.. Haha! I know- I can't justify spending so much money on photos!! Seriously, this is a great race weekend- you should definitely check it out if you can! And thanks for following along :-) I love sharing my running experiences with others and love following other's experiences too! My wife and I make a great team, we both inspire each other and are able to lift each others spirits during the low times. It really helps during those times in a training cycle to have someone to talk with who truly understands you inside and out. She is my "sole"-mate! Yes- it's awesome to have someone who "gets" you through a training cycle! My hubby inspires me. He is always encouraging me and works out with me to help keep me motivated. Working out together is such a great way to spend quality time together! My wife inspires me and encourages me to be/do my best every day. She leads by doing and encouraging others. So cool that you were chosen to participate in such a cool event! This looks like a really fun race weekend. I love how they have multiple events/distances over the weekend, especially the dog run! The medal collection is pretty cool too, very unique. The steel stacks remind me of Gasworks Park here in Seattle. When I was a kid we used to climb and play on the equipment. You and your hubby are inspirations for tackling all of these adventures, together! I hope to run this series of races in 2018! Great job. You inspire me to run this race next year. It was the same weekend for Marine corps, which was my first marathon. So next year Half on my calendar. It's a big race weekend on the east coast- so many good ones to choose from! I have added this to my bucket list and look forward to it next year! But first...Dopey...oof! My dad, a lifelong runner/marathoner, inspires me to believe in myself and run!